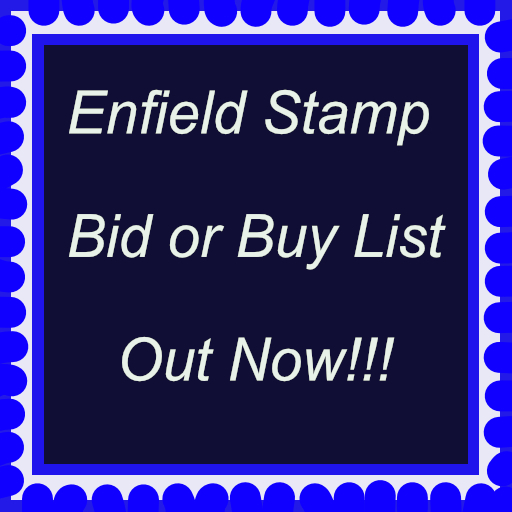 Enfield Stamp Bid or Buy List 449 - Enfield Stamp Company Ltd.
Other recently acquired lots featured overleaf include G.B.Locals, Herm, Jethou, Sark, Alderney, Lundy and Postal Strike mail. Eric formed a huge stamp & postal history library. One of our customers, Brian, volunteered to sort this out and list it for us. Little did we realize that he would find it totalled over 1800 books and take the best part of a month to organize! So coming shortly we will be sending out a country by country book list. We would appreciate customers contacting us with requests. This might be just the time to acquire that elusive book you have been searching for. And you might be able to let the family buy it for you for Christmas?! 7 Forgeries:Sel.of classic from 19th Cent.,inc:Ionian Is.,GB.1d. 8 G.VI M.ranges from Occ.Ital.Cols.MEF.1943-47 set to 2/6d.(SG.C. style St.pages inc:one page of G.B.QV.1d.red plate Nos.U.,G.B. order on stuffed St.page,vals.to 5s.,needs sorting,fair to fine. M.range to 25c.,Aden to 3a,Burma to 1r.,etc.,unchecked for Perfs. 14 Mostly Dominions,early to 1960’s M.& U.coll.on album pages,vals. 19 1937 Coro.sets M.or homemade pages,complete,good. (202) Total Cat. 77 1990’s Pres.packs,with 1993 Prehistoric Animals,SG.1423-8 & MS.
80 1929-32 M.& U.range on leaves inc:1931 10s. (U.,one blunt Perf. St.pages,inc.useful M.(much UM. )inc:1966-73 Deci.currency set UM. 89 1901-29 M.Staircase range on St.card,vals.to 5d.,War Tax Ovpts. 1s.,1916-19 M.range to 6d. (2)& 1s.,etc.,high cat.,fair to good. 98 1971-90 Comm.& Defin.sets coll.on leaves inc:1986 set to $8(C.
106 1970-95 small UM.blocks & MS.range on St.page,fine. (49+2MS) STC. 115 Small,predom U.,range on St.page inc:triangle 1d.(Fiscal),4d. 124 1953-65 M.range on St.pages with dup.inc:1955-60 set to 100m. 125 1974-97 U.coll.on Hagner,cards & St.pages,some Comm.sets,Defin. 127 1912-35 U.range on St.page with some dup.inc:1912-15 12Pi.& 18Pi. (both faults),1934 Pictorial set to 6Pi. (2)& 9Pi.,fair to good. Office issues range to 3t.,then those issues with various Ovpts. 151 1947-51 M.(few U. )coll.on printed album pages inc:1947-55 Defin. 1s.M.,2 1/2d. (btwn.SG.27 & 30c.,C.£100 min. ),G.VI vals.to 1/3d. 155 1917-90 U.Defin.coll.on leaves,good ranges with H.vals.inc:25m. 156 1930’s-40’s M.& U.coll.on album pages inc:1946-7 Air set M.& U. 163 Early range on St.card comp.SG.187,191,223,247,268,276,307,good. 164 1916-40 M.& U.range on leaves inc:Sowers M.with SG.358(3 inc.
171 1906-27 M.range on St.page inc:1906-07 1Fr. (C.£39),1913-16 var. 173 1891-1912 small Unused & U.range on leaves inc:SG.6(C.£36),8 (C.
178 Bavaria & Wurttemberg,small M.& U.range on leaves,fair to fine. 179 1865 1/3Gr.,2Gr. (2)Unused & 1Gr.U.,on St.card,spacefiller only. Allenstein issues,few Comms.,Hindenberg,etc.,etc.,much to sort. one Canx unaddressed,one Postal Stationery Unused,unusual,good. 192 U.sel.on homemade page,needs sorting for Plate Nos.,fair to good. 198 Edw.VII,predom U.,coll.on leaves,DLR’s with 2/6d.chalky,5s. 200 1971 PPC.of Spitfire MK5B,flown at Biggin Hill Air Fair,Reg. 209 Holy Island Boat Mail(LINDISFARNE),three diff.PO’s & one E.
214 1962 & 1963 Europa sels.U.on description cards,FDI,good to fine. blue,U.on illus.First Day covers with pair U.on last day illus. 224 Channel Islands:1971 Europa Mail Service set 20p.green & 3/6d. 237 Arms covers:1941-44 small range inc:2 x 1/2 on Local E,2 x 1/2d. vals.to £1(Guern- sey SG.MS.1085 C.£5),many sets,high face,fine. five in diff.colours,& Alderney packet 5p.,1-p.,15p & 25p. 260 1967 Europa Ovpt.on MS.,A4 sheetlet comprising 3 Imperf. sheetlets(4 diff.colours),Bird Defin.sheetlets of twelve(5 diff. 264 C.1963 Islands & Hydrafoil set to 3s.in UM.sheet of fifty,fine. 271 1966 Churchill Ovpt’d Anniv.set in UM.sheets of twenty, fine. 290 Imperfs. (2)to 1902 U.range on leaves,with 1896 Olympics 40c.,1Fr. 291 Hermes Heads U.sel.on Hagner with dup.,with numbers 5L.(3),10L. 20L. (14),ideal for sorting & shades,mostly 3 margin,fair to good. World Fair set M.(SG.238-41 C.£60),1939-47 5k.Perf.14 M.(SG.C. Air ranges,various Perfs.,1937 Jub.set M.,1939-45 Defin.set M.
(25a brown-red U. ),1938 Eriksson MS.M. (x 3),etc., fair to good. Views 35a UM.,1928-29 10a Ovpt.U.,1930 Parl.range to 10a Air M.
305 1855-1906 M.& U.coll.set out dealer style in part with some dup. with better inc:Chamba Q.V.vals.to 1r.U.,6a M.,Gwalior Q.V.vals. 30s.to 5r. (SG.9-14 C.£10+),also few contemp Indonesian sets,good. 314 1920’s-30 U.coll.on homemade pages,needs sorting,fair to good. 318 1942-45 M.or Unused(SG.853,862,867,874,880)range of vals.to 50r. to 1s.,1938 3d.Temperance(2,SG.C.£10 ea. ),1941 Uprising set(SG. 324 1851-63 Unused & U.range on leaves inc:1856-63 5c.,10c.(3),20c. Stamp Centenary set U. (SG.779-80 C.£60),1911 Jubilee 2c.& 5c.M. block M.,etc.,also Tripoli 1932 Trade Fair 30c.to 1L.25c.M.,good. 338 Sel.of mostly M.items with better inc:1947 Kyoto stamps MS.M.(SG. MS.457 C.£33),1954 & 1956 National Park MS.M.in pres.folders(SG. 340 `Postage Stamps of the Japan’ special folder presented by “K. 352 1928 Flood set with 1928 2Fr.Accession,M.,on page,fine. (5) STC. 358 1964-90’s M.& U.coll.on St.pages with vals.to 10s.,some Comm. & 1949-59 Defin.25f.light blue(SG.397 C.£24),etc.,fair to good. 369 1885 small U.range comp.SG.3(C.£50)8(C.£170),16(C.£50),& 140(C.
370 1938-47 M.& U.coll.on album pages inc:1940-47 Defins.25c.- 60c.M. (32)unsorted for Perfs.,1898 Coro.1g. (SG.C.£180 but thinned),dup. 5g.,1948 to 2 1/2g.(M. ),Surchs.& 1947 Ovpts.,etc.,fair to fine. 1939 set,1941 Forces set,1941 Charity set,etc.etc.,good to fine. 377 1948 M.range on page inc:set to 25g. (SG.517-26 C.£160),Comms. 380 G.VI M.coll.on leaves inc:Defins.to 3s.,Comms.etc.,good to fine. 382 1937-2000’s M.& U.accum.in no order on St.pages with modern vals. ennial set(U. ),G.VI to 3s.(M. ),Q.E.II to 10s.,etc.,fair to fine. 384 Predom Q.V.& Views U.range on St.page,hours of sorting for Perfs. 387 1947-65 U.coll.on pages,nearly complete to SG.48,good to fine. 394 1962-70 13p.to 40p. (SG.176-178)in UM.Imprint blocks of six,fine. 404 1977-95 UM.M.range of MS.on St.pages set out dealer style,fine. 420 1903 New P.O.set to 5L.with two 2L.,all U.,on page,fair to good. 426 1976-80 UM. (6 U. )coll.on St.pages,fine. (57+1MS+1 bklt.) Total C.
427 All periods to 1980’s M.& U.coll.in St.page in random order,inc. 434 1965-66 M.& U.coll.on pages with some sets inc:Seiyun 1966 Defin. 440 1937-38 Fournier Ptd.Defin.M.range on page comp.1c.,2c.,10c.,15c. 451 1956-59 M.& U.sets on pages,complete from SG.571-605(except SG. 452 Pro Juventute:1939-42 M.& U.sets on pages inc:1929-42 sets U. 453 1959-60 M.& U.Comms.sets on written up pages,inc:1955 PTT Conf. & U. (only lower selvadge),UPU.set M.& U.,1949,1950 & 1951 Nat. 465 Pro Juventute:1930-38 M.& U.sets on pages complete inc.1937 MS.
seal cancels,Es Salt three lines,various other cds.,good to fine. issues inc:1947-48 100L.,Express & Airs,all Pmk’d 7.11.47,fine. 518 Earlies to 1999 evtensive U.coll.on leaves,Comms.& Defins.,in SG. 521 1921 PLEBISCITE Ovpt.set with 1922 Surch.vals.,M.,on page,fine. all U.on small pieces,also 10Pf.& 40Pf.M.,on page,good to fine. some better MS.inc:1961 500d. (SG.MS.1031 C.£170),1962 Tito MS.